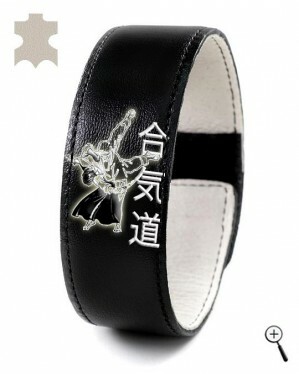 The black magnetic leather band with picture of Aikido grip is made of black natural leather. The inner part of the magnetic leather band is of porous leather in beige color and absorbs sweat without stifling. Cleaning the magnetic leather band of sweat can be made in cool water by rubbing the surface with a soft cloth.